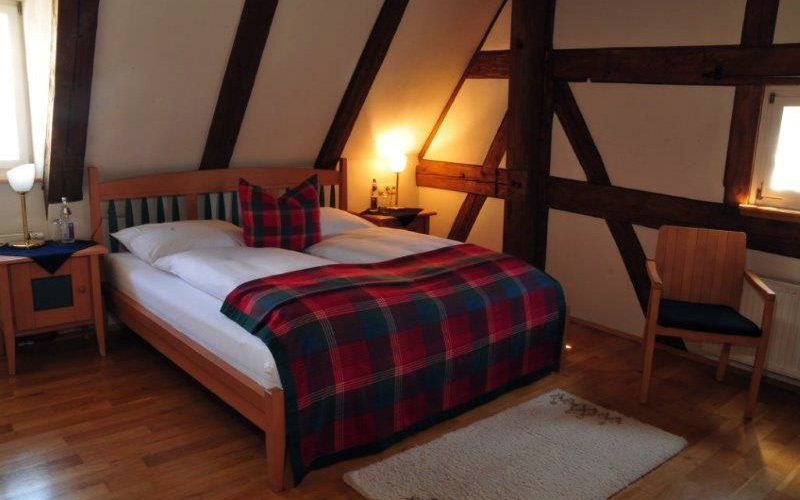 Our suite „Wolf von Vellberg“, with a wonderful view on the church Stöckenburg, is approximately 35 m2 in size. The room is equipped with a double bed, wardrobe and seating area. The living room holds a flat screen TV, sofa, two armchairs and a desk. Since the sofa can be converted into a bed, the room suits well as a family room. The bathroom, with its decorative beams, provides a unique atmosphere. The suite „Anna von Vellberg“ is approximately 50 m2 in size. 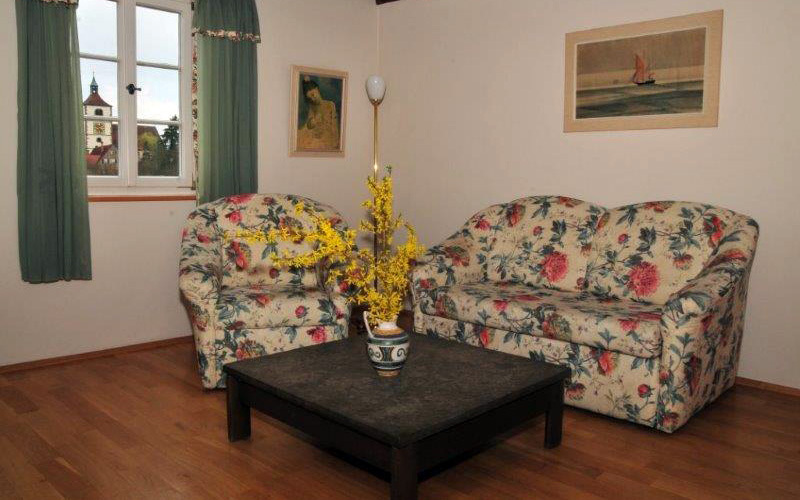 It is similar to the „Wolf von Vellberg“suite, with addition of a DVD player, and two pull-out sofas instead of one. In the spacious bathroom there is, in addition to a shower, also a bathtub. The window in the living room has a view of the romantic town square. 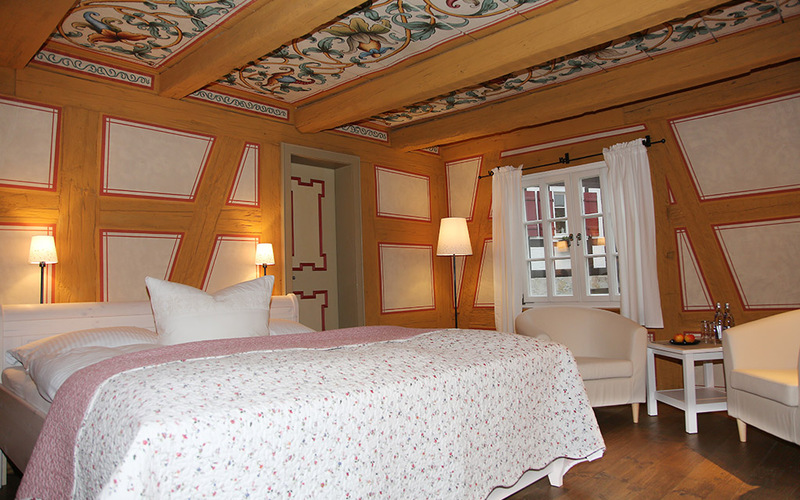 In the night, before you fall asleep, you may take a glance at the artfully hand painted ceiling. Our double rooms are between 19 and 28 m2 in size. All rooms are equipped with a double bed, night stand, wardrobe, flat screen TV and a hairdryer. In most of the rooms you may also find a seating area with a table and chairs. If you’d like, a spare bed or childbed can be booked, the cost depends on the age of the child. In the breakfast area, highchairs are available for your child. Our single rooms are between 19 and 28 m2 in size. 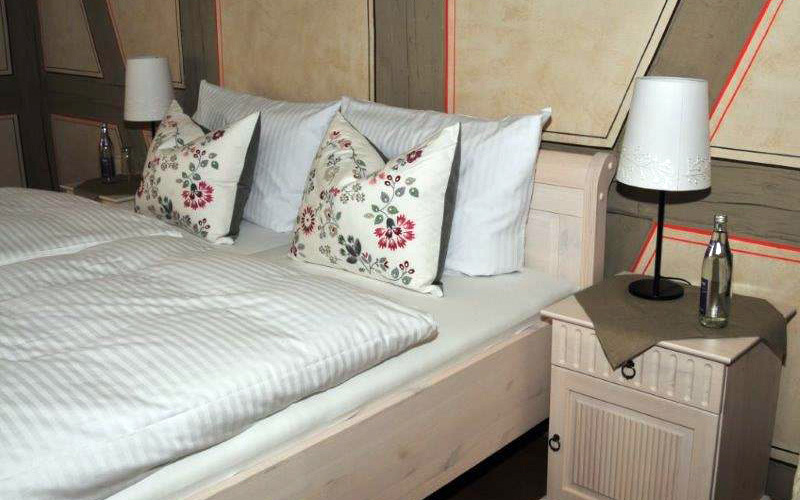 All rooms are equipped with a bed, night stand, wardrobe, flat screen TV and a hairdryer. In most rooms you may also find a seating area with table and chairs. If you’d like, a spare bed or childbed can be booked, the cost depends on the age of the child. In the breakfast area, highchairs are available for your child. Check-in is between 2 pm and 6.30 pm, or by agreement. Check-out is until 10 am, or by agreement. It is possible to store baggage during the day of leaving, should you wish to. Breakfast buffet is served every day. The wide range allows you with special diet or allergies to enjoy our buffet as well. Lactose free milk is always offered. Should you need gluten free bread, just inform us when you book your room. Breakfast is between 7 am and 9 am during weekdays, between 8 am and 10 am on weekends and holidays. We keep two rooms as allergen free as possible. In these rooms pets are not allowed, and the covers are made of synthetic fibre. There are also wooden floors without carpets. If you prefer one of these rooms – just tell us when you book. After agreement, you may bring pets to the hotel. You will then be charged with an extra 5,00 € per night, for cleaning. Parking spots may be found in the historical moat nearby. For loading and unloading of baggage, you may temporarily park in front of the house. Free short time parking is also available in the town square. If you come by bike and want to park it save it is possible to do this by the hotel. Should you require this parking, please call us in advance this will facilitate the handling. This hotel is a „hotel garni “. Should you look for a culinary evening, we recommend the restaurants nearby.